This page allows a Citizen of the United Kingdom to purchase a Single Entry Minor Visa for Afghanistan. Visa Type: Single Entry Minor Visa Travellers under the age of 18 at the point of travel may require a Minor Visa as opposed to a regular Tourist Visa. Please refer to the document list at the bottom of the page for details of whether this will relate to your travel. If not, you should request a Tourist Visa. A Single Entry Visa to Afghanistan will allow entry to the country on one occasion for up to the maximum stay within the validity period. Re-entry is not allowed. If you need the ability to return to the country within the same validity period you should choose a different visa type. Valid For: 3 months The visa validity period refers to how long the visa remains active from the time that it was issued. Please ensure that you leave the country before the visa expires. Maximum Stay: 30 days The maximum stay refers to the total amount of time that you can remain in the country during a single visit. For longer stays, you would either need to consider a residents visa or leave and re-enter the country using a multiple visit visa. Processing Time: : 2 weeks The processing time is how long the visa would usually take to be obtained from the point at which we have received all the required documents to process your order. It does not include the time needed to post your document(s) to us or for them to be returned to you. This visa relates to a person under the age of 18 at the time of travel. Please check the documents required carefully for any specific advice relating to the travel of a minor. Liaison with the Afghanistan Embassy in London for any queries and attendance where required. No more wasted time for you on the phone or in line at the Embassy. Collection, Check, Scan & Dispatch of your completed Afghanistan Visa. Let us make sure everything is as expected for worry-free travel. Whilst Vital Consular is not affiliated with the Afghani government, we have been working with the London Embassy network since 2008. You don't have to put up with unanswered calls and long queues - we do that for you. For this, our prices include a service fee to handle your Afghanistan visa. 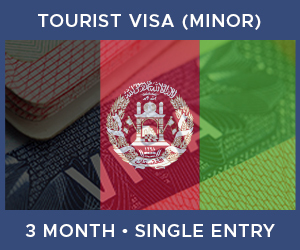 In order to apply for an Afghanistan Minor Visa you will need to supply a number of items. Click on any of the icons below to learn more about each one. You will need to fill in a Visa Application form for us to start processing your visa. Upon completion of your order you will receive the application form from us via email. Should you need assistance completing the form, please don't hesitate to contact us. Failure to correctly complete the application form may lead your application being rejected. You are required to provide a UK standard passport photo to acquire this visa. 45 millimetres (mm) high by 35mm wide (the standard size used in photo booths in the UK) and not be a cut down version of a larger picture. Be a close-up of your full head and upper shoulders, contain no other objects or people, be taken against a plain cream or light grey background, be in clear contrast to the background and not have 'red eye'. In your photo, you must: be facing forwards and looking straight at the camera, have a plain expression and your mouth closed, have your eyes open and visible, not have hair in front of your eyes, not have a head covering (unless it's for religious or medical reasons), not have anything covering your face and not have any shadows on your face or behind you. It must have been taken within the last month. If you are obtaining a Visa for your child, or if the applicant is under the age of 18, you will be required to provide a copy of their birth certificate. If the applicant is under the age of 18, then written permission from both parents is required to allow travel. If the child is travelling with one of their parents, most Embassies will require written consent from the other parent. If the applicant is under the age of 18, the Embassy requires both parents' passports in order to process the visa. To acquire this visa, you will need to provide a copy of your utility bills or bank statement as proof of your address in the UK. Information about the host: full name, date of birth, address, telephone number, occupation, type of home (owned / rent house / flat / room), host's status in the host country (If the host is residing in that country a work visa, student visa, permanent resident, or is a citizen or any other legal status), signature. Information about the guest: full name as shown on their International Passport, date of birth, the person's address and telephone number, relationship between the host and the guest, the purpose of the trip (friendly visit, holiday, wedding, birthday party. ), exact entry date and exit date. Other information: purpose of trip, what business will be conducted, what kind of Visa you need (single, multiple, duration etc.). A personal statement detailing the purpose of your journey, a brief itinerary of your trip and who you will be visiting. To acquire this visa you will need to provide evidence of your occupation in the UK. Depending on your situation, this could include proof of employment, self-employment, retirement, unemployment or studies. This could be via a letter from your employer or a company registration certificate. If you are unemployed, you will need evidence of your income support allowance. If you are a student, you should include a letter from your school or university to confirm your attendance there. If you are self-employed, you should provide a letter from your accountant, solicitor, bank manager or local Chamber of Commerce, confirming self-employment or business ownership in the UK. An itinerary that should include details of your flights, address of your accommodation and the places you are visiting on which days. Please note that your itinerary may influence the number of entries granted on your issued visa.